Would you rather listen to this article? Use the player below, download the MP3, or listen on iTunes. “What exercises should I do for the Lift Like a Girl programs if all I have access to are dumbbells?” That has been asked so frequently that it’s time to provide the answer. Or if you have dumbbells at home, your gym has limited equipment, or you simply prefer dumbbell exercises, use this program for great results. There are exercise-demonstration photos, a four-week dumbbell workout program, and printable workout logs. Before we get to the workout program, it’s important to understand the advantages, and limitations, of dumbbell exercises. To build maximum strength, the barbell is the best tool. 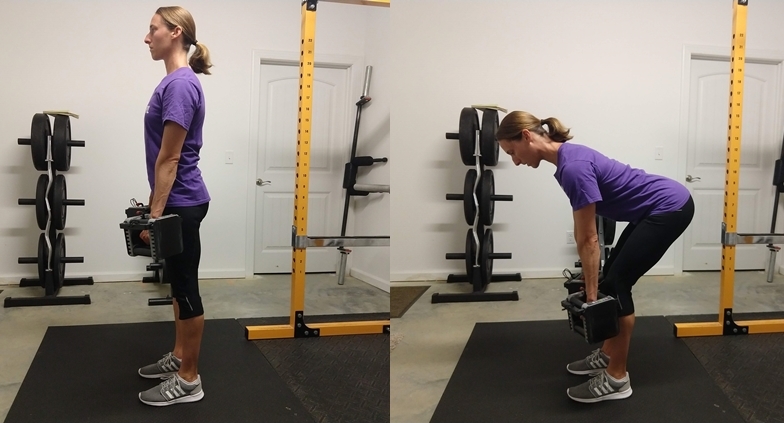 You can get stronger, build muscle, and build a better-looking body with dumbbells, but if you want to deadlift twice your bodyweight or barbell squat 1.5 times your bodyweight, you must train those lifts frequently with a barbell. Increasing the weight can be challenging. 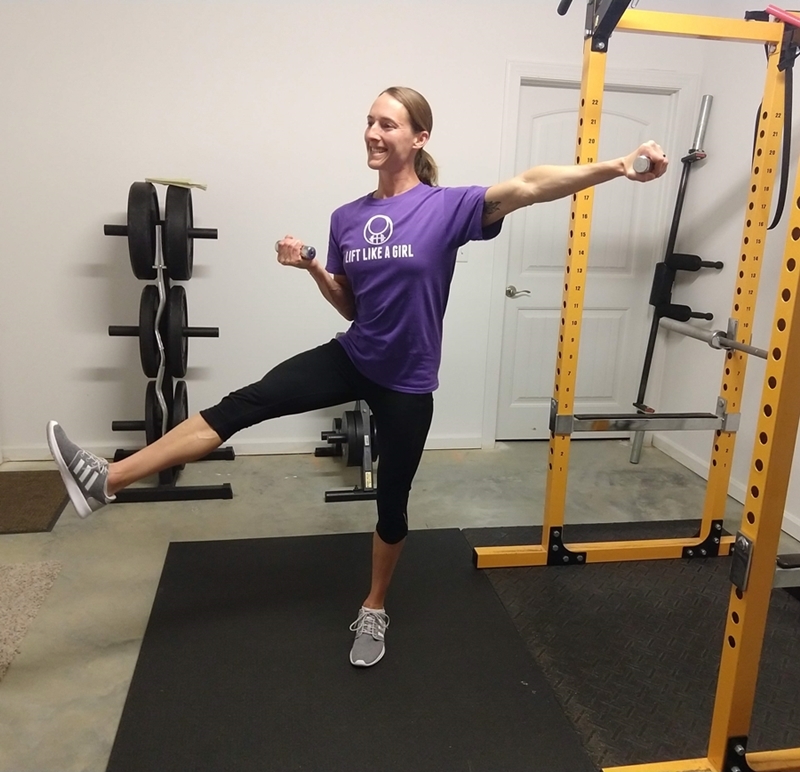 This is a tremendous perk to barbell training — exercises are infinitely scalable, especially when using fractional plates, and weight increases are more manageable. For example, a five-pound increase on a barbell exercise, say, going from a 100-pound bench press to a 105-pound bench press, is much more manageable than going from a 20-pound dumbbell bench press to a 25-pound dumbbell bench press. The former was a 5% increase distributed over both limbs, the latter a whopping 25% increase for each limb. There are ways to work around this limitation, covered below. Can’t productively train in a very-low rep range. Once out of the beginner stage of strength training, you can safely perform a challenging 3-rep set for the barbell bench press. You can’t perform a challenging 3-rep set for a dumbbell bench press productively (i.e., performing a 3-rep max, where only 3 reps are possible — you can obviously perform “just” 3 reps, but it would be with a 6-rep max, or greater). Getting very heavy ‘bells into position can be awkward, and the risk:reward ratio for attempting such a heavy load is minimal and therefore not advised. With those disadvantages in mind, does that mean dumbbells are useless? Of course not. Some people only have dumbbells to work with. Some people only want to use dumbbells, and they do have advantages. Greater confidence with dumbbell exercises. Someone may be more comfortable, and confident, performing a dumbbell goblet squat compared to a squat with a barbell on their back. This individual can use dumbbell exercises to build strength and confidence, then transition to barbell training to build greater strength. In this instance, dumbbell training can be a stepping stone to barbell training. Then again, some people prefer to use dumbbell exercises exclusively. That’s great too. No need for a spotter or power rack. You don’t need a training partner or the security of a power rack with dumbbell exercises since there’s no risk of a dumbbell getting pinned to your throat, or stapling you to the ground, as with their barbell equivalents. If, for example, you fail on a dumbbell bench press, you just drop the weights to the side. Home-gym and travel-friendly workouts. Increasingly more people have a set of adjustable dumbbells and a weight bench at home. They’re economical, take up very little space, and don’t require a lifting platform or concrete floor as needed for barbell deadlifts. Many hotel facilities also have a rack of dumbbells, so that makes dumbbell workouts travel friendly. Modern-day gym-friendly workouts. There’s an increasing amount of gym chains that only have dumbbells and machines. If dumbbells are all you have available, you can still achieve incredible results with them … if you train correctly. That’s where the Lift Like a Girl Dumbbell Workouts come in. If you’re going to use dumbbells exclusively, your workouts must use mostly compound exercises, like those used here. There are two workouts. We’ll first introduce the workouts and their demonstration photos, then we’ll go over the workout details. Primarily works the legs and glutes. 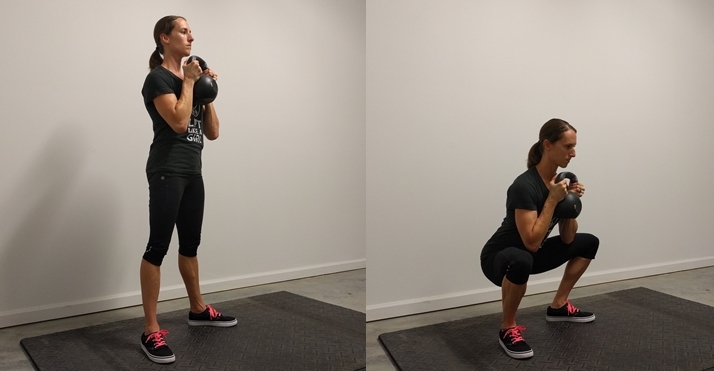 I’m using a kettlebell here but you can use a dumbbell by putting the heels of your palms under one end of a dumbbell (the handle will be vertical). Works the chest, front of the shoulders, and triceps. Don’t have a weight bench? You can do a dumbbell floor press instead. This alternative uses a shorter range of motion, but it’s a good alternative. This exercise works the back and biceps. This exercise works the hamstrings, glutes, upper back, and grip. 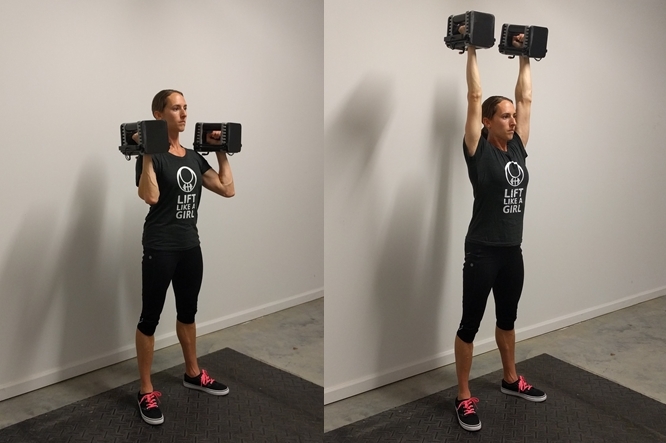 This exercise works the shoulders, triceps, and core from having to stabilize your body. Perform three workouts per week, alternating the two workouts. Do this for four weeks, completing both workouts a total of six times each. The following layout assumes a Monday, Wednesday, Friday workout schedule, but do what works best for you. Nonconsecutive days are recommended. The workouts begin with 2×8-12 (2 sets, 8-12 reps) for all exercises; once both workouts are completed twice it increases to 3×8-12 (3 sets, 8-12 reps each set). Here’s a four-week training schedule that shows how to alternate the two workouts, and when the number of sets increases from two to three. Do that for four weeks and enjoy your newly-forged strength and awesomeness. The Lift Like a Girl dumbbell workouts begin with two sets for each exercise so you can focus on learning proper technique and you won’t get so sore you struggle to walk up stairs … and get off the toilet. After completing both workouts two times, the number of sets increases to three. If you’re unable to increase the weight because it feels too difficult, stick with the previous weight and try to add more reps when you repeat the workout. Then, after another workout or two, attempt the heavier ‘bells again. Would you like to easily track your workout performance? Use the provided printable workouts log below. 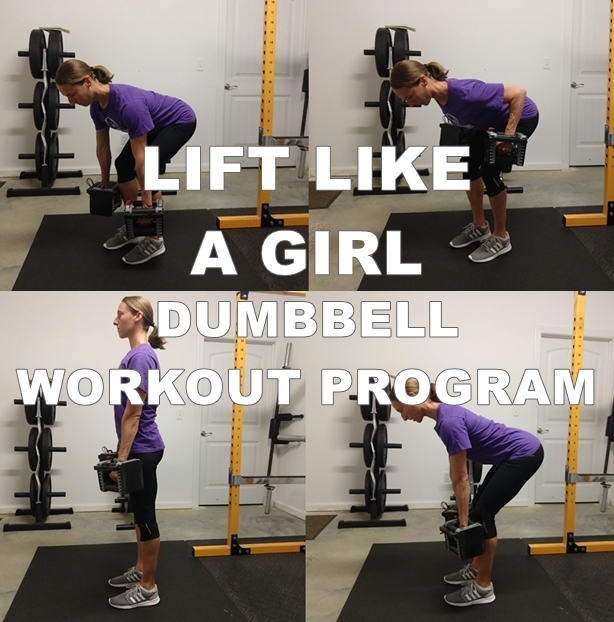 Click to download the Lift Like a Girl dumbbell workout logs. What Should You Do After Four Weeks? You can increase the number of sets from 3×8-12 to 4×8-12, or switch to different variations for each exercise and repeat using the training schedule above. Or perhaps you’ll want to transition to barbell training. Start your journey with Phase 2 in Lift Like a Girl or create your own program using these how-to videos: squat, deadlift, chin-up, row, bench press, press. Want a Done-For-You Dumbbell Guide? If you prefer to work out with dumbbells, then check out the Dumbbell Strength Training Guide. It’s complete with done-for-you workouts, exercise-demonstration videos, and workout logs. You can get all the details and a sneak peek here.